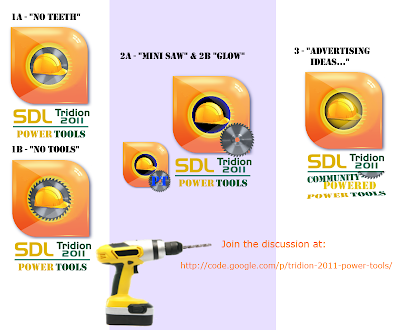 (05-Oct-2011) Update: See the final below or on the PowerTools Google Code site. 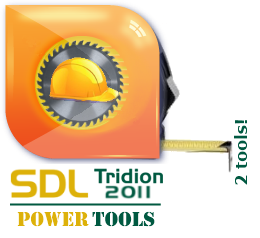 In the end we'll (hopefully) have one main logo and consistent branding for the Tridion PowerTools reboot. Julian Wraith wondered if that was a character from Fraggle Rock. Chris Summers (Urban Cherry) and Dominic Cronin reminisced about the "good old days..."
The latest proposal by John Winter places the hard hat within the logo. (26-Oct-2011) Update: less than a day after posting this, we added Raul Escudero as another PowerTools committer bringing us to 30 participants. He even brought a new logo contribution below. I'm not sure how we'll decide on the final logo with this is all great, creative work! Oh and just to be clear, we're also getting "real work" done. See the PowerTools site on Google Code for recent updates, including the "v1.1" release of a working tool. We're still "working on" the logo and I'm sure there's more to come out of this. * Follow or join the discussion on the PowerTools group. *Replace "working on" with "having lots of fun with." (03-Nov-2011) Update: We're close to wrapping this up! Based on additional feedback, I stitched some ideas into the following candidates. We'll update and choose a winner in the next week or so. See if you can find your suggestions in the design elements. Is the saw too scary? Good! Because these are (will be) power tools. Actually we're working towards a relatively safe and useful tool set, but like any powerful, automated tools it's safer when you read the manual, understand the implications, and respect the power such tools offer. (03-Nov-2011) (Almost) Done! See current winner 1B which we'll likely use after a final round of discussion, ideas, and suggestions. Unless we completely drop this line of thinking, the final logo will have elements from the following. Column 3 is based on a idea from Ryan O'dell, aka "binarybasher." He pointed out we're missing the community aspect in the logo, something that's come up in past Skype chats with the PowerTools group. We can play with the idea to start some sort of marketing campaign for the tools. 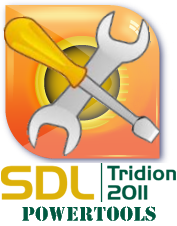 To add to this, I felt the Tridion logo kind of looks like a measuring tape. See the last image above for something we can use to chart promote our PowerTools progress. Nice work & clever usage! 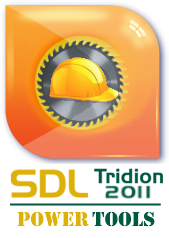 What if you put the hat in smaller size in front and to the lower-right of the Tridion logo? Kunal #3 in reverse.. Yes! Not having the source images/layers made that sheen particularly challenging to duplicate. We combined parts of most of the ideas along with Nuno's color preferences, Elena's lower-right "label" suggestion, and ingmaru's observation on screwdriver direction. The discussion link again, just in case (join to post there but comments welcome here as well). There is a hidden marketer in all of us. I love the creativity here. The logo looks great.